Connect with family and friends and tell them all about the exciting vacation you are having in Thailand without exorbitant roaming costs with an unlimited data SIM card. Enjoy lightning fast web speeds, get updates from your social media accounts and make hassle-free travel arrangements. 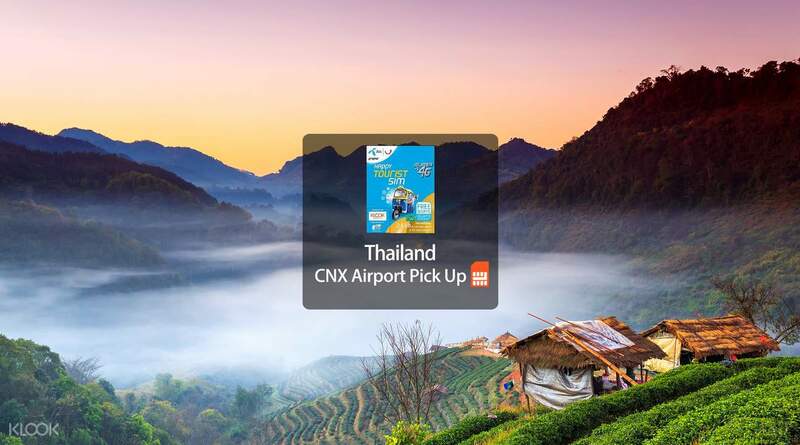 Available for pick up right when you arrive at CNX airport, the SIM card will let you connect to 4G or 3G network (depending on the area) and will let you make the best of your vacation without worrying about the details. The unlimited data SIM card is good for 8 days! The staff will wait for you up to 2.5 hours from your flight landing time. If you are delayed longer than 2.5 hours after landing, please email or message to check if the staff is still available. No need to look for the booth, they were waiting for us at the arrival. Very convenient and reliable. No need to look for the booth, they were waiting for us at the arrival. Very convenient and reliable. Very friendly & helpful stuff waiting outside Gate 11. Help out to do all settings & installation. Explain clearly when question asked, English speaking so no communication barrier. Dtac coverage well at chiang mai & did not encounter any coverage problem. Enjoying the data usage throughout my entire trip! Thanks KLOOK ! Very friendly & helpful stuff waiting outside Gate 11. Help out to do all settings & installation. Explain clearly when question asked, English speaking so no communication barrier. Dtac coverage well at chiang mai & did not encounter any coverage problem. Enjoying the data usage throughout my entire trip! Thanks KLOOK ! FAST + CONVENIENT! Instead of buying SIM card in 7-11, you can buy it on Klook at 1/3 price! When I arrived at the exit door of CNX, I saw a young lady waiting for me there, holding a sign of my name. In 2 mins - exactly 2 mins - I had had my SIM card activated! So fast! Love Klook! FAST + CONVENIENT! Instead of buying SIM card in 7-11, you can buy it on Klook at 1/3 price! When I arrived at the exit door of CNX, I saw a young lady waiting for me there, holding a sign of my name. In 2 mins - exactly 2 mins - I had had my SIM card activated! So fast! Love Klook! I am very satisfied with the service provided. First of all, person incharge meet me and my friends at the airport after we inform them our arrival. After meet up, person in charge help us change our sim card and make sure the connection is ok before we leave. The pre-book service is very much convenient and with very reasonable price. Connection also very good in Chiang Mai and Bangkok. Thank you very much for the great service provided! I am very satisfied with the service provided. First of all, person incharge meet me and my friends at the airport after we inform them our arrival. After meet up, person in charge help us change our sim card and make sure the connection is ok before we leave. The pre-book service is very much convenient and with very reasonable price. Connection also very good in Chiang Mai and Bangkok. Thank you very much for the great service provided! I dont have problems when using the tourism sim card. The klook. Staff waited for us at arrival hall and also help us to activated the card. The sim card fast but the only problem when we went up the doi Ithanon that very limited coverage. I dont have problems when using the tourism sim card. The klook. Staff waited for us at arrival hall and also help us to activated the card. The sim card fast but the only problem when we went up the doi Ithanon that very limited coverage. All went super smooth. The Klook agent was waiting for us at the arrival gate with the SIM cards, helped us to install them in our phones and even arranged a taxi for us. Internet works well and we also got nice discount codes for Grab rides. All went super smooth. 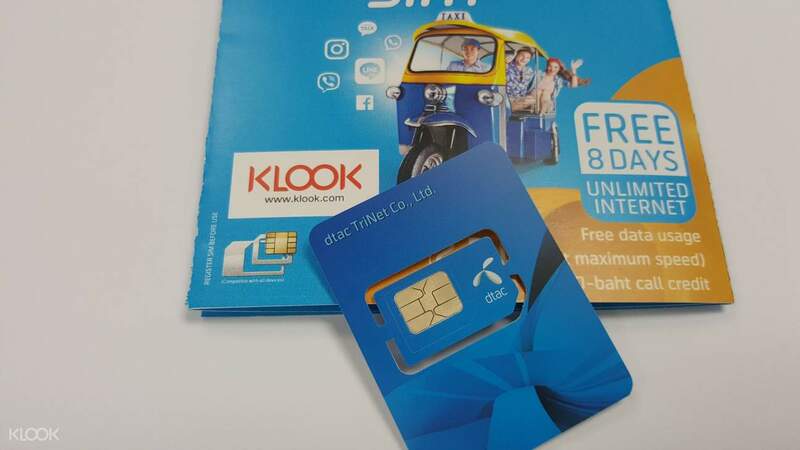 The Klook agent was waiting for us at the arrival gate with the SIM cards, helped us to install them in our phones and even arranged a taxi for us. Internet works well and we also got nice discount codes for Grab rides. This is the best sim card for a trip up to 8 days. The signal is very good! It is easy to set up and the klook staff is very friendly answer our questions. The klook staff is on time waiting for us and teach us how to use. The signal is very fast ! This is the best sim card for a trip up to 8 days. The signal is very good! It is easy to set up and the klook staff is very friendly answer our questions. The klook staff is on time waiting for us and teach us how to use. The signal is very fast ! Very practical. With only 4.5 usd, we have 3GB internet for 8 days and 100B for call. The Klook employee was waiting for us just in front of the gate of the airport. And with this sim card, we have also 1GB internet promotion for the first day and 5 promotion code for Grab. Very practical. With only 4.5 usd, we have 3GB internet for 8 days and 100B for call. The Klook employee was waiting for us just in front of the gate of the airport. 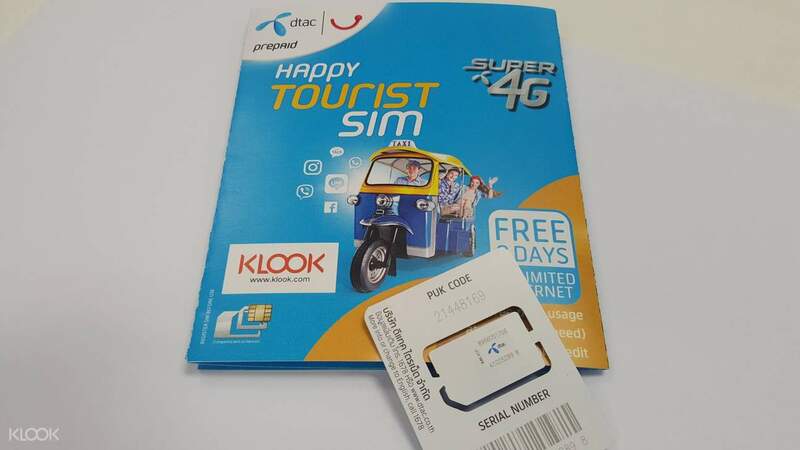 And with this sim card, we have also 1GB internet promotion for the first day and 5 promotion code for Grab.